Just like its bigger brother (the Lumina 700, also reviewed in RBR), the Lumina 220 has four main modes — low, medium and high, plus the same useful flash mode for being seen when riding in the daytime. The Lumina 220 is a very small, self-contained unit and weighs only 126g. Low output is 80 lumens, with aclaimed runtime of 4 hours, medium is 120 lumens, with claimed runtime 2 hours, 45 minutes, and the highest output is 220 lumens, with a claimed runtime 1 hour, 30 minutes. Recharging the Lithium-Ion battery is easy using the supplied mini-USB cable that can be plugged into your computer or a wall outlet with an adaptor (not supplied). Also supplied is a helmet mount which I did not test for this review. The light output is noticeably different from the Lumina 700, as you would expect. At the highest output it can be used as a “see-by” light when the speeds are below 20mph. The beam is dispersed widely enough to allow road hazards to be picked out. However, the main uses I can see for this light are lower speed riding, such as running errands or simply ambling about town. Because technology has improved to the point of the Lumina 700, for example, weighing only 46 grams more, and producing more than triple the number of lumens, it or another high-output light would be a far better choice for any real commuting needs. Good run times and a quick four-hour recharge time are this light’s standout points, but its utility is limited. 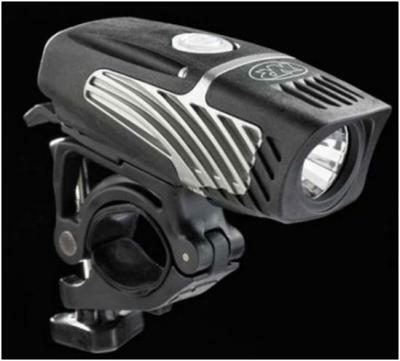 It’s an acceptable light for slower, around-town riding, but other lights should be considered for more demanding uses.